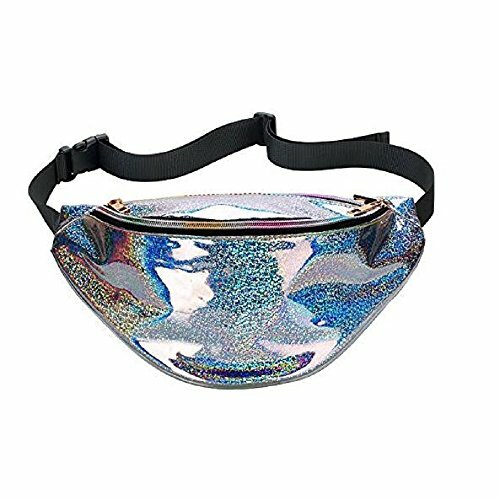 SUPER SHINY DESIGN - Our holographic fanny waist pack is a perfect way to show yourself in beach,raves,festival,club and etc.It can bring out your unique temperament and personality, and become the focus of attention in any occasion with this Super fantastic metallic fanny pack bag. 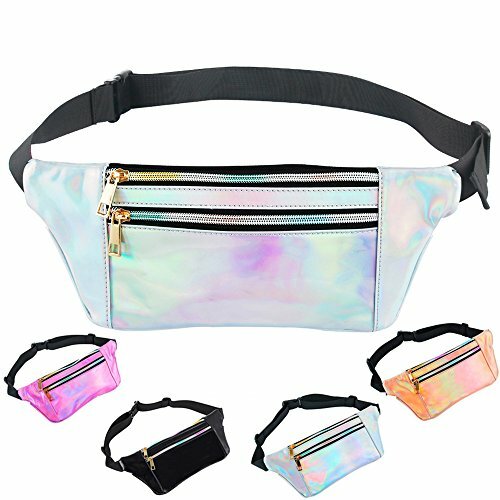 SUPREME MATERIAL: Classic holographic PU material, 100% brand new, unique and stylish and portable. Not completely waterproof, only the outer PU leather is waterproof. 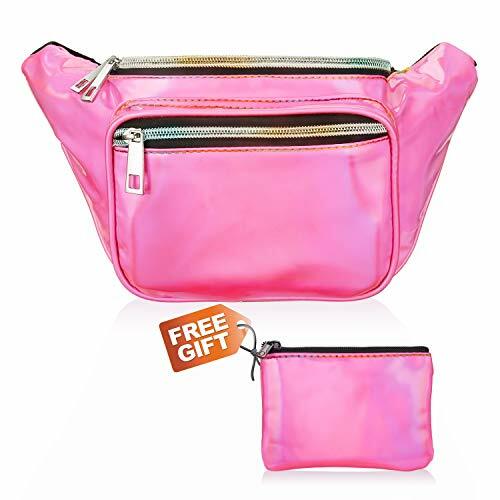 MULTI POCKET: Spacious 2 zippered compartments and 1 anti-theft back pocket for your convenience and fit any size phones on the market (an iPhone 8 Plus), wallet, passport, keys and all your other necessities, waist bag lightweight and easy to wear. 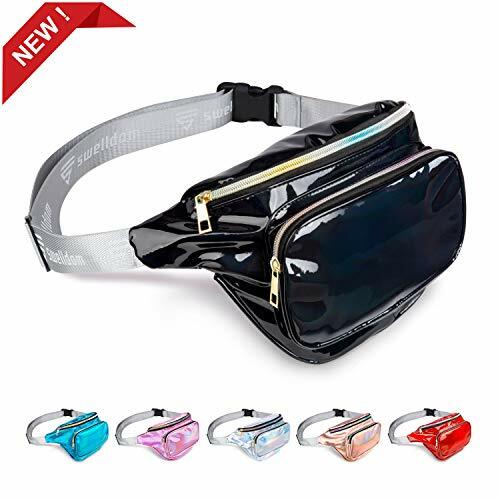 EASY ADJUSTABLE -The belt comes with adjustable buckle, easy to adjust the tightness according to waist， Includes an adjustable nylon waistband that fits 20" to 43" waist, so you and your kid can run around with everything you need on hand, hands-free and worry-free. 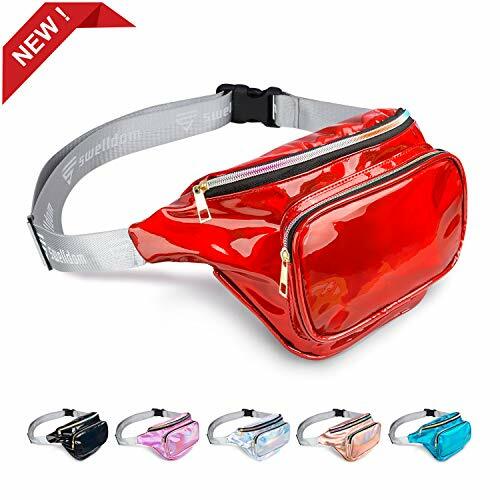 MULTI-PURPOSE AND APPLICATIONS: Perfect waist pack for Disney theme parks, music festivals, hiking, running, jogging, camping, partying, raves, barbecues, festivals, traveling and other outdoor activities . Note: It is "splash proof". It will keep your things dry if it's just rainy or if it gets splashed. But if it's submerged in water the water will get in through the zippers. 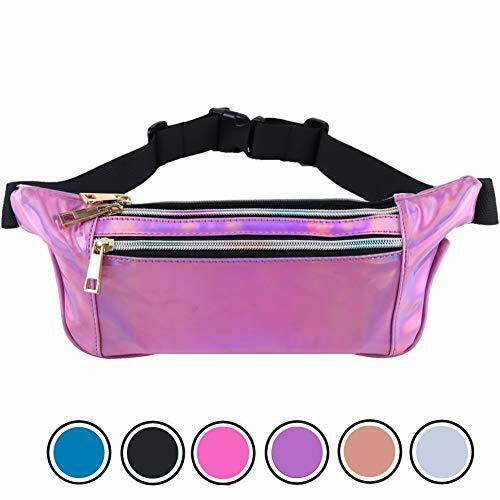 ★【COMFORTABLE AND ADJUSTABLE】If you're looking for a hands-free way to carry your stuff, but don't want to lug around a backpack, our fanny pack is perfect, it is lightweight and easy to wear, and you can adjustable the fanny pack waist strap to fit you best. You even feel safer when going out with your baby as you do not have to be shuffling through a bag and holding him/her. 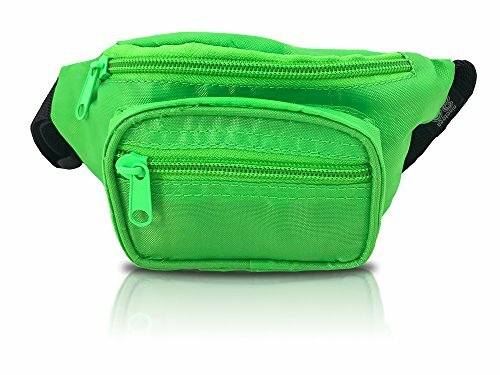 ★【3 POCKETS】 This fanny pack has 3 separate pockets that are each very roomy with sturdy zippers. 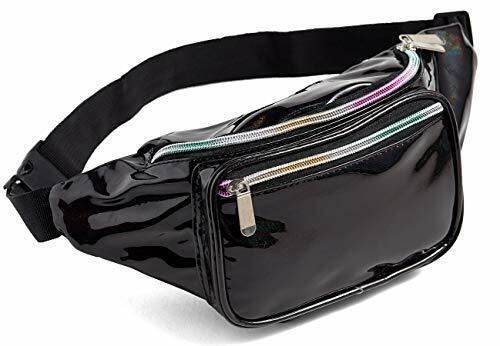 The bum bag has enough space to hold keychain, coin purses, credit card, cell phone, lipstick, passport, sunscreen, sunglasses and a few more things. And it is so much easy to access your things and put it back with smooth zippers. 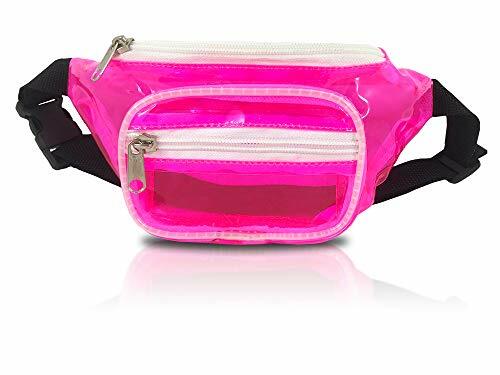 ★【MULTI-OCCASIONS】This fashion fanny pack is perfect for the theme parks, travel, music festival, party, concert, camping, hiking, rave, carnival and every situation. 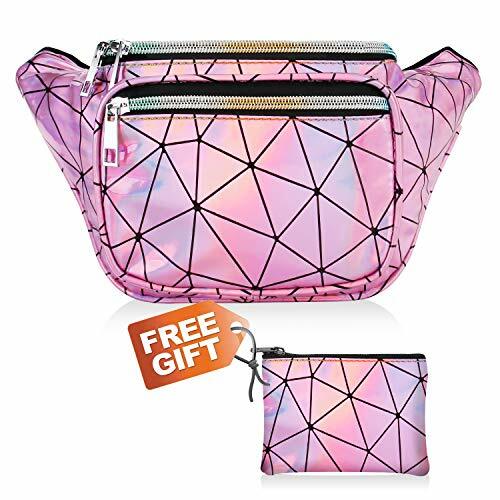 The cute bag fits both girls, women and men. 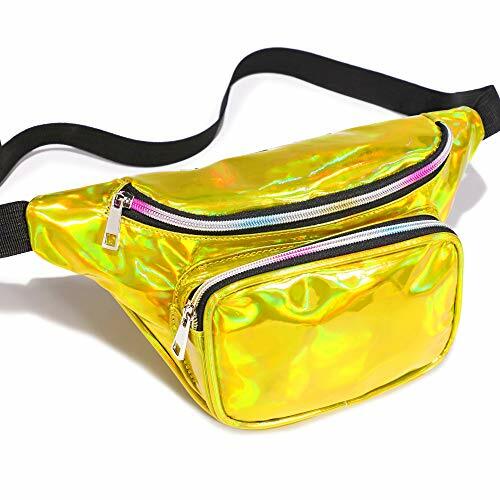 The fanny pack looks amazing out in the sun as its laser film PU leather material, you will get so many compliments on it. Even your family will be able to spot you in a crowd! 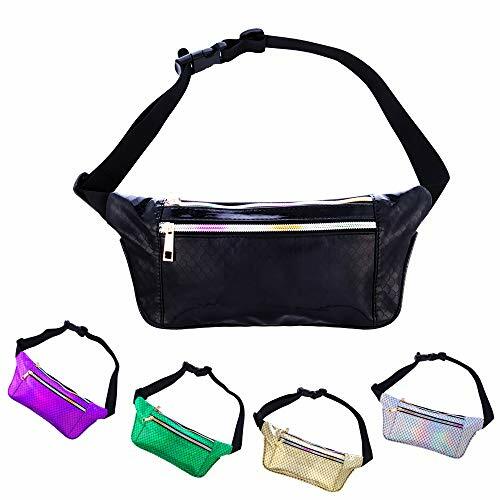 ★【WELL MADE】The fanny pack is well constructed and sturdy, the zipper slides back and forth easily, plus, the clip fastens securely. 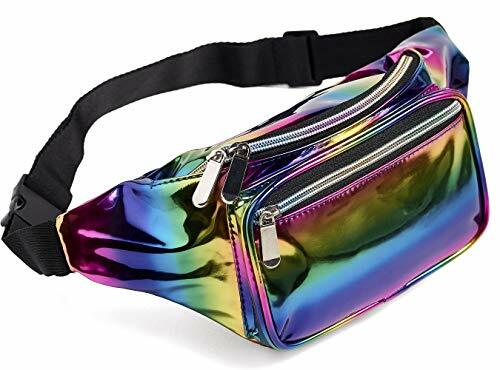 The fanny pack can prevent water splashing but not prevent submerging. ★【SATISFACTION GUARANTEED】Gain the confidence to go hard with us! 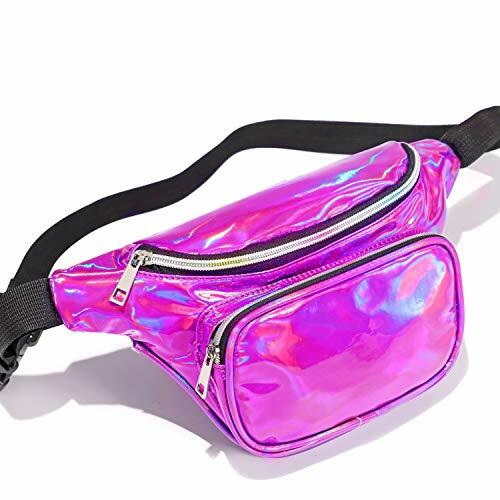 Our fanny pack is built with durability in mind for every design, In the remote possibility that you're not satisfied with our product, just contact us, and we will gladly give you a new fanny pack replacement. It all comes backed by an unbeatable LIFETIME WARRANTY and satisfaction guarantee. EASY ADJUSTABLE - Includes an adjustable nylon waistband that fits 20" to 43" waist, so you and your kid can run around with everything you need on hand, hands-free and worry-free. CAPACITY ENOUGH - Spacious 3 pockets zippered compartments all with reinforced double stitching and nylon lining. Pockets can comfortably hold water bottles, iPhone X/8 Plus/8/7 Plus, Samsung Note 8/S9/S8, sunglasses, cards, keys, wallet, food, and whatever else you may be traveling with. BUY CONFIDENTLY - Our 100% Money Back Guarantee, If for any reason you are not satisfied with our product you will receive a full refund no questions asked and hassle free. CAPACITY ENOUGH - Spacious 3 pockets zippered compartments all with reinforced double stitching and nylon lining. Pockets can comfortably hold water bottles, iPhone X/8 Plus/8/7 Plus, Samsung Note 8/S9/S8, sunglasses, cards, keys, wallet, food, and whatever else you may be traveling with. each pocket. Made of PVC, easy to clean with a damp cloth. 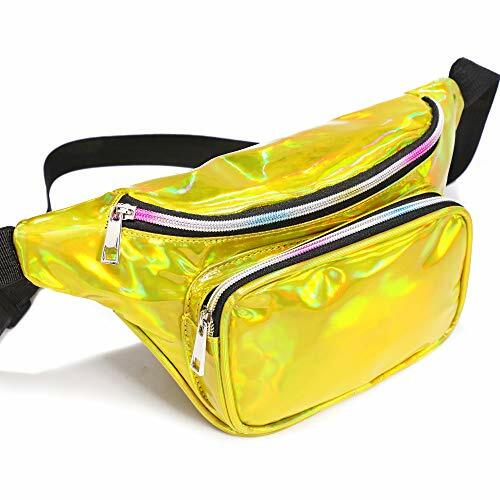 ☀【Upgraded Fashionable Design】: Swelldom Upgraded Version fanny packs for women made of high-quality shiny neon PU leather and great lining. 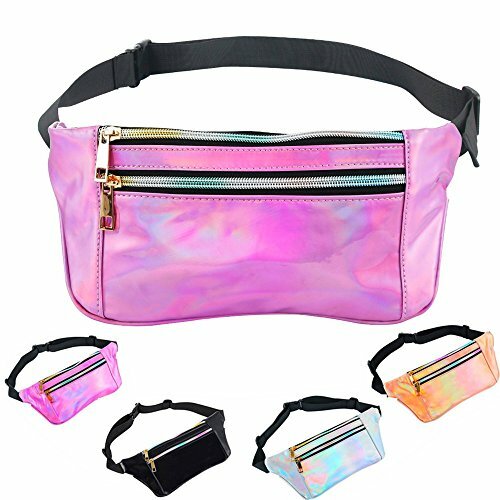 Exquisite craftsmanship with cleanly finished seams, our waist bags built to be durable and fashionable.Forget all those cheaply made women fanny pack.Amazingly, Our fashion holographic fanny packs show varified shiny colors with time.Getting very popular because of vibrant holo surface and practicability.Order waist bags for women right now. 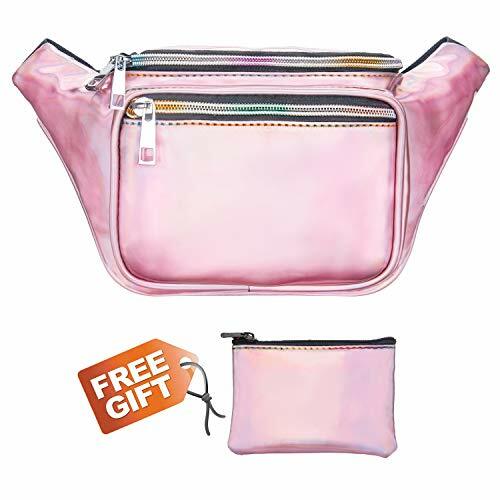 ☀【3 Rainbow Zippered Compartments】: To meet all your needs - This practical shiny neon fanny packs for girls with 3 pockets is a great way to hands free.One main pouch with inner compartment, one front pocket and back secret one.Allowing your essentials separated, organized and safe.Waist bag main pouch is roomy enough for phones, cosmetics, wallet, sunglass and other items.Front pocket fit well for iphone 8 plus.Back secret zipper pouch keeps your valuables out of sight for extra safe. 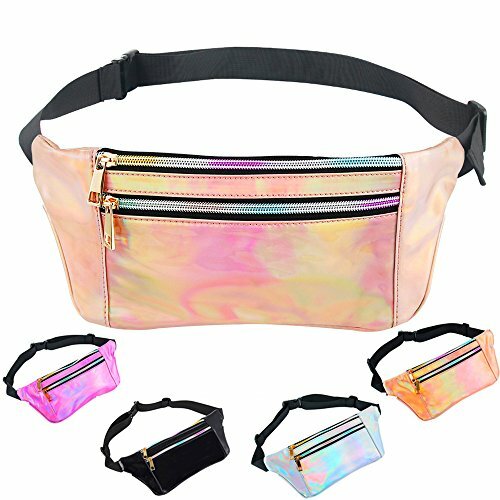 ☀【Adjustable Belt and Versatile 】: Are you looking for travel or festival gifts for family? 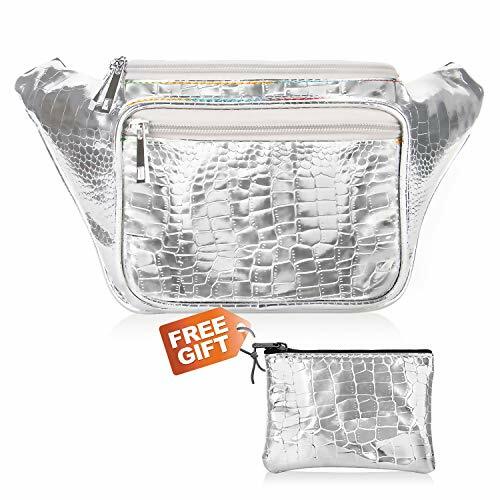 Our silver waist bags for women is a great choice.More lightweight & relaxed than backpack.The holographic fanny packs for women with long adjustable strap to fit waist range 20 to 49.5 inch.Suitable for both men and women or kids.The metallic fanny packs is ideal for travel, festival, hiking, rave, disneyland trip, running, concert etc.The fanny packs can be carried as Chest, Shoulder, Crossbody bag. 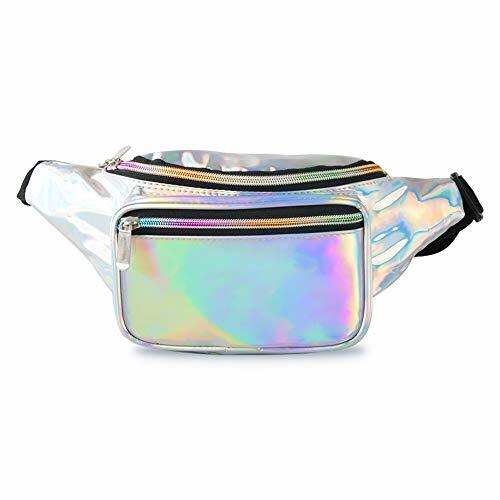 WATER-RESTANCE DESIGN - Metallic hologram fanny packs feature one big pockets for keeping your ID cards and money safe from theft. Water resistant and durable, your belongings will stay dry thanks to the nylon lining inside each pocket. Made of PVC, easy to clean with a damp cloth. 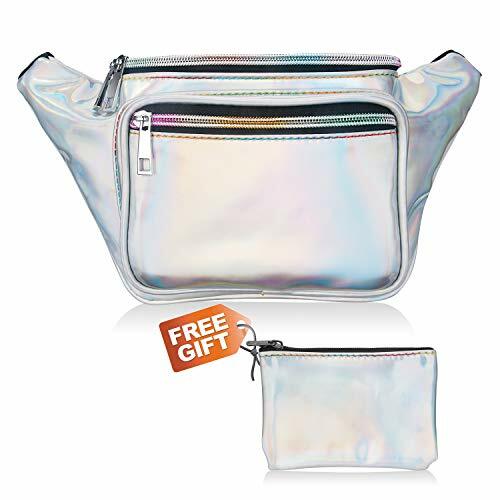 WATERP-RESTANCE DESIGN - Metallic hologram fanny packs feature one big pockets for keeping your ID cards and money safe from theft. Water resistant and durable, your belongings will stay dry thanks to the nylon lining inside each pocket. Made of PVC, easy to clean with a damp cloth. 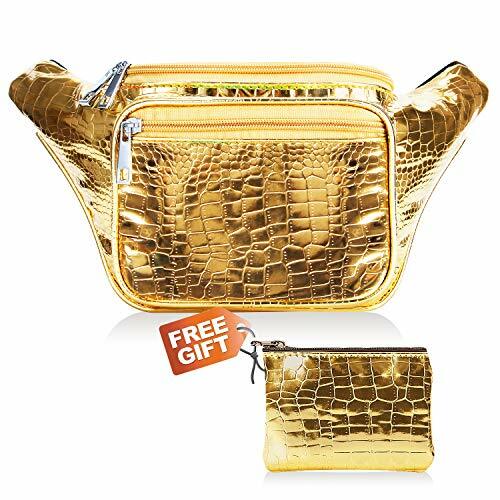 BAG SIZE: 12"×5"×3.5"(L×H×W). It fits up to a 42" waist,PLEASE NOTED that material is waterproof,but the zippers aren't. 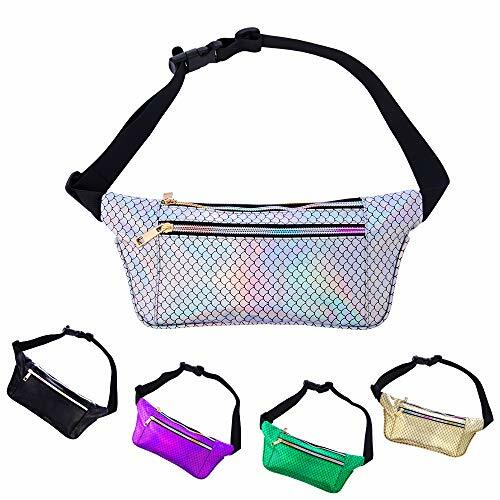 Multifunction：Hologram waist pack can be used as a waist bag,chest bag or crossbody bag, one bag for many uses！Perfect for beach, party, concerts, raves, barbecues, festivals, traveling and other outdoor activities. 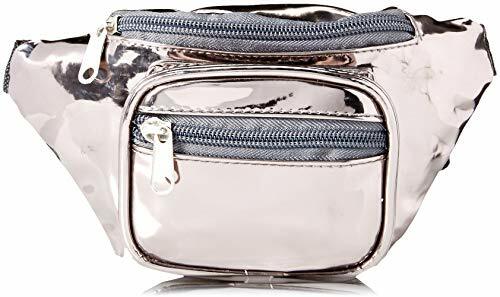 Space: Big enough to hold your ID card, concert tickets, cell phone, wallet, keys, Swimwear & Shorts, and it can protect your privacy at the same time. 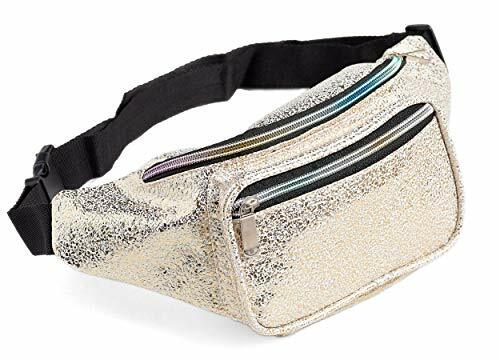 Fit For Everyone: Long adjustable belt strap extends up to 42 inches and down to toddler sized，Thanks to the adjustable waist strap makes our fanny pack fit for men, women and kids. 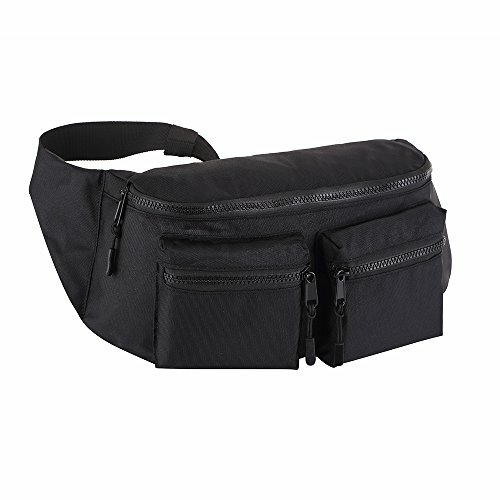 -Fanny pack material: Nylon 900D, not only durable, but also light and compact for your comfortable wear. 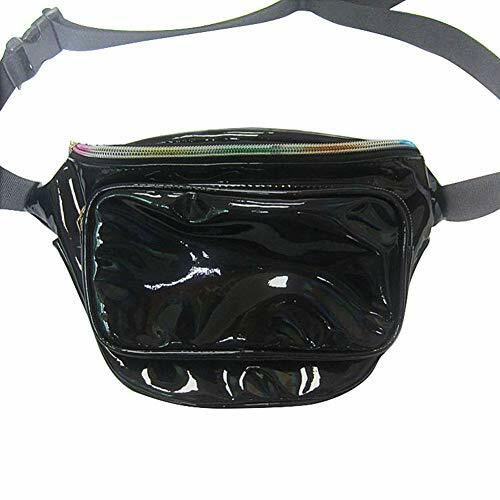 -Bum bag wearing styles: It has great flexibility. 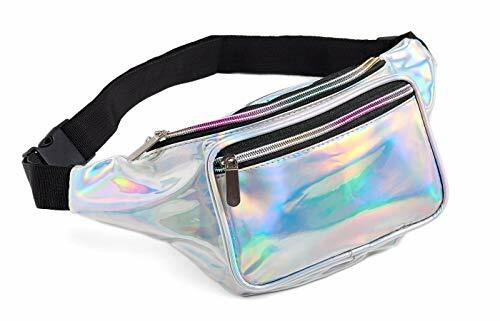 You can use it as fanny pack, chest pack and shoulder bag. Also it can be worn in the front or back of body. 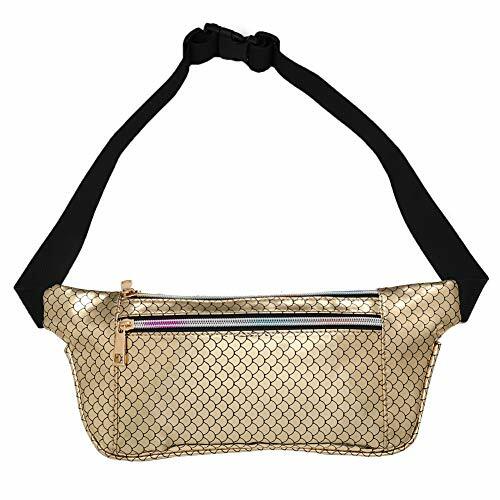 -Long adjustable strap: Belt extends up to 54 inches and down to the smallest size needed,suitable for men and women. It is much more secure & relaxed than carrying a bag when traveling or workout. 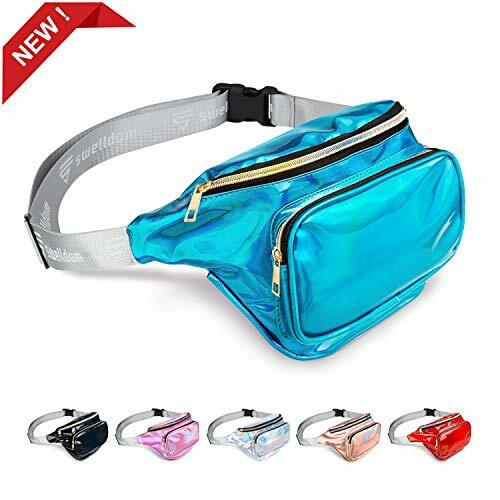 -Larger convenient waist pack. 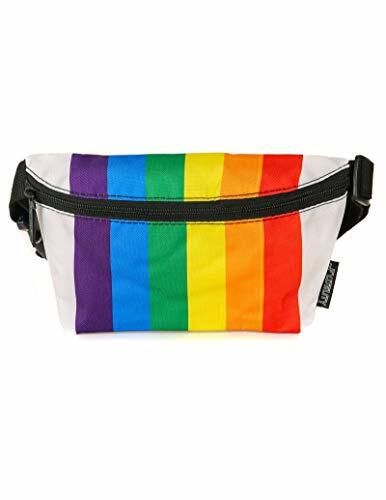 It can carry a phone, cash, cards plus a few other essentials and can be worn on your hip, over the shoulder or tight under your arm. 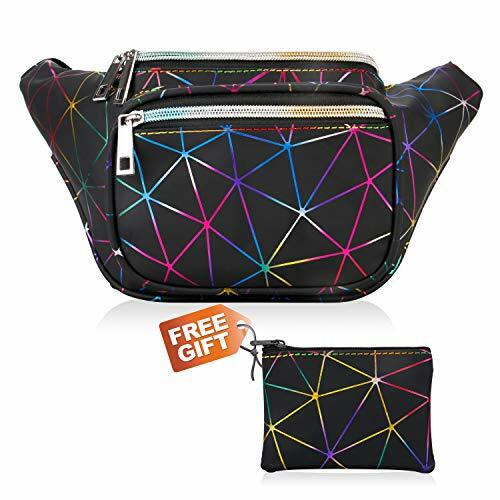 It's perfect for walking/traveling/biking/hiking/museums/theme parks and everyday using. 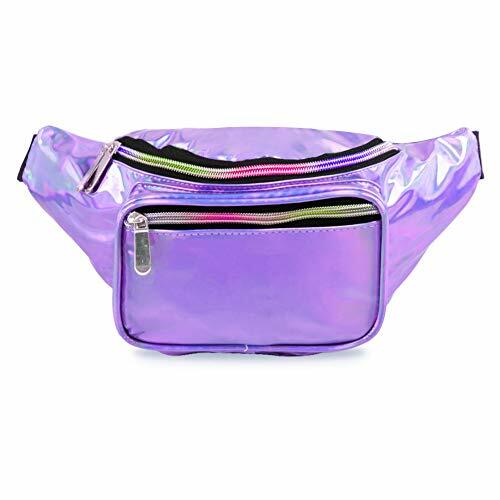 -Size: The main large pocket:11.42" x 8.27"; The two small pockets in the front:4.72" x 4.72"
DESIGNED FOR KIDS - Perfect size fanny pack for toddlers, kids, and tweens. 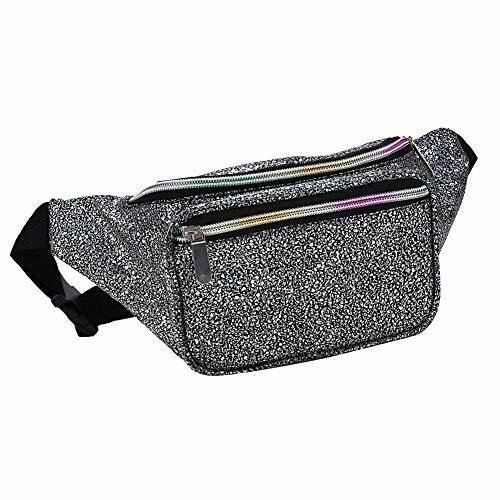 Each waist pack measures 7.5 Inches long x 4.5 Inches tall ( think big enough for iPhone Plus ). 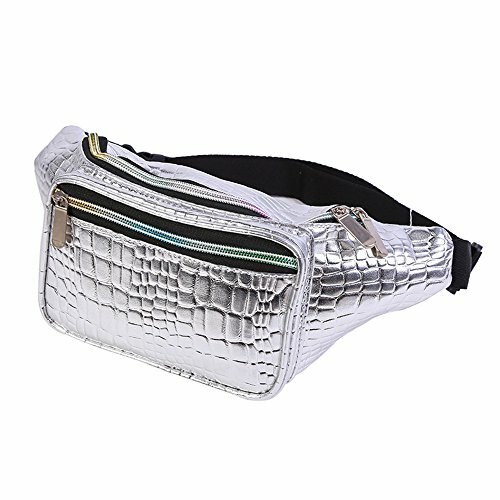 TRENDY & FASHIONABLE- Your friends may laugh but the retro fanny pack is having a resurgence. Celebrities like BEYONCÉ, Jared Leto and Cardi B. have been spotted wearing these hip bags. 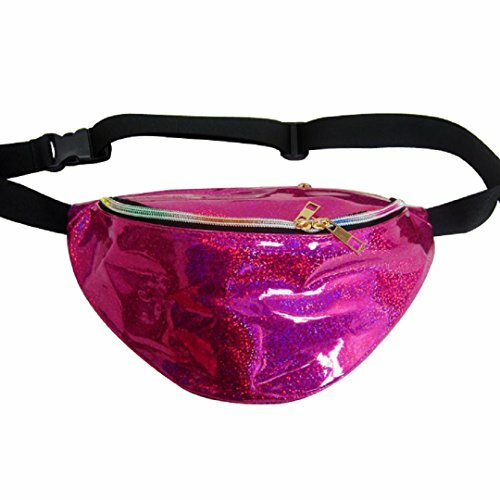 CUTE & FUNCTIONAL - It is not hard to see why these fun and cute bum bags are so hot right now. Your kids can remain hands free while carrying their most important belongings like that hatchimal. 3 POCKET DESIGN - The large pocket is big enough to fit an iPhone Plus. The front pocket is perfect for ear buds or other trinkets. The hidden back pocket is perfect for credit cards or cash. 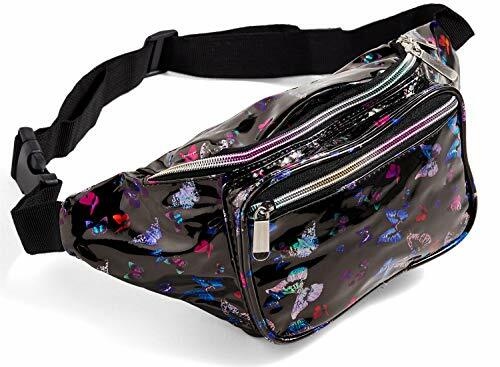 HIGHLY WATER RESISTANT - Don't worry if you are spending the day at Disney, dancing away at a rave, or attending an 80's / 90's party, your child's belongings will stay dry during a light shower. 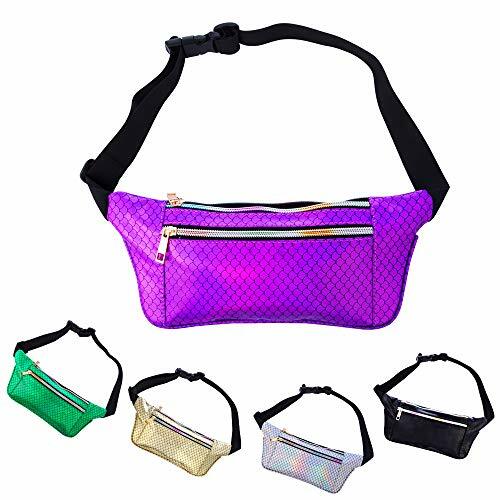 FYDELITY fanny packs measure 9" x 5.5" x 1" (24cm x 14cm x 3cm). The BELT STRAP LENGTH adjusts from 28" to 44" (70cm to 111cm) and an optional 16" extender is available for additional purchase. FYDELITY uses the best possible materials & construction techniques. All seams are double stitched and our belt straps use a cotton blend this is super strong while being soft to the touch and won't irritate your skin. 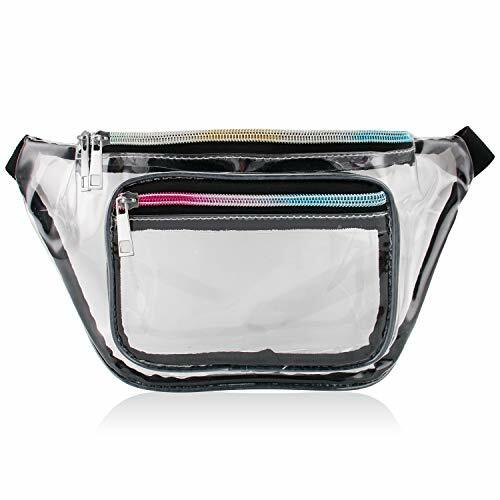 WIDE FUNTION FOR FESTIVAL:Fanny bags are great for travel,festival party,rave and running and hiking. 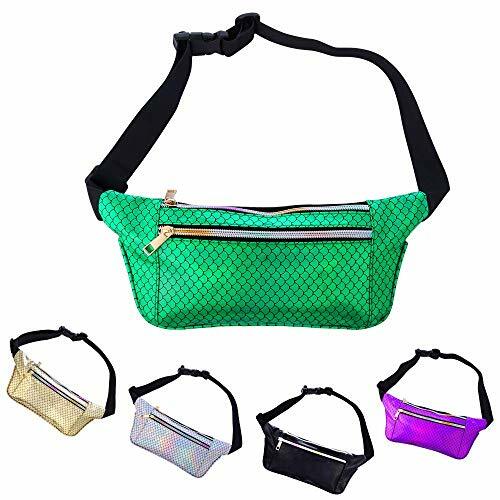 Waist bag is to make traveling fun and can comfortably hold water bottles, iPhone , keys, wallet, snacks, and whatever else you may be traveling with. 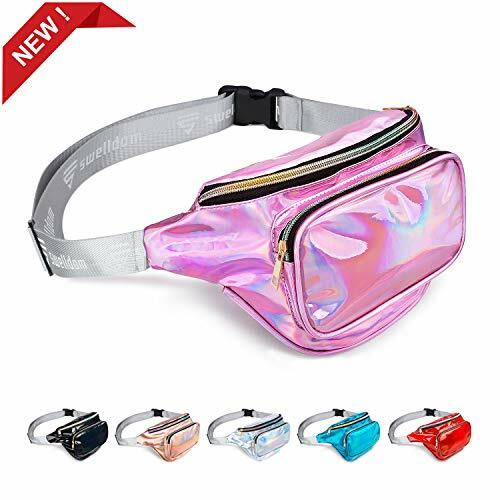 Your waist fanny pack can conceal and store all your personal belongings whether you are just out for a walk, or participating in a sporting event. 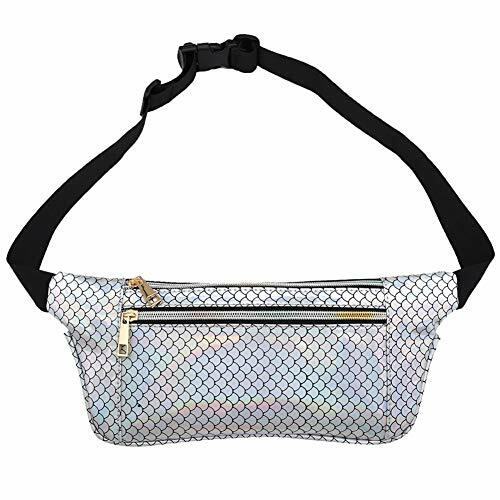 FUN DESIGN:The metallic hologram fanny pack have 3 zippers pockets, 1 back pocket for cash,tickets,ID cards. 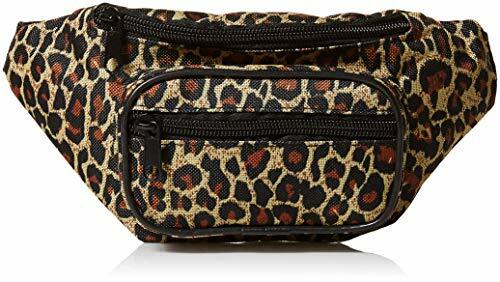 1 main front compartment and 1 top compartment for phone,wallet,lipstick,passport,tissue,key,water holder etc. Water resistant and durable, your belongings will stay dry thanks to the high quality holographic PU leather. 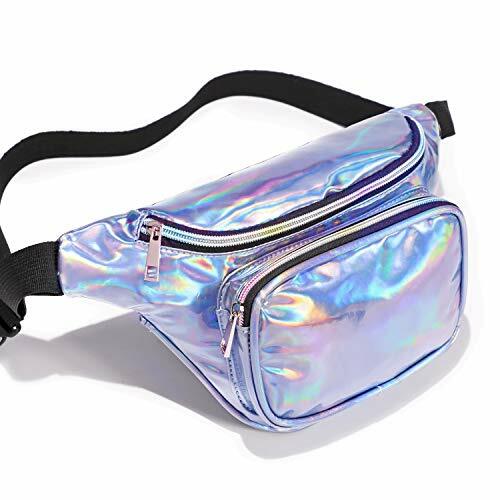 FASHION STYLE :You may have thought the fanny bag went out of style with your parents but they are the latest craze and provide you the best hands free carry option around. 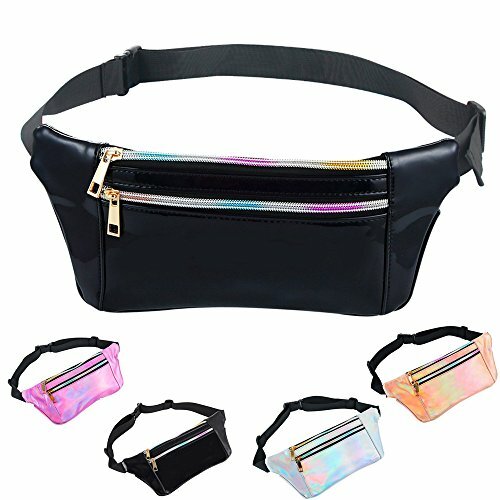 When you are wearing your fanny waist pack you will feel comfortable and free. 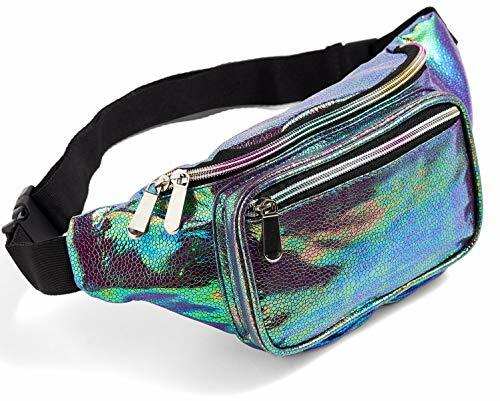 The fanny pack holster can be hidden under your jacket and worn on your side. 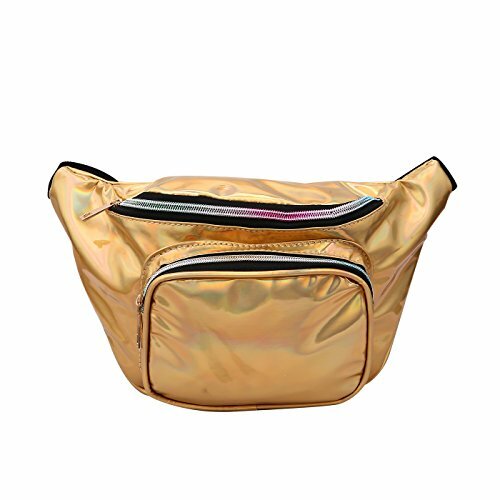 The fanny bag can hang at your side or be worn on you back like a backpack. ADJUSTABLE STRAP: Long adjustable belt strap extends up to 46 inches and down to toddler sized, better quality 100% premium durable nylon belt,so you and your kid can run around with everything you need on hand, hands-free and worry-free. 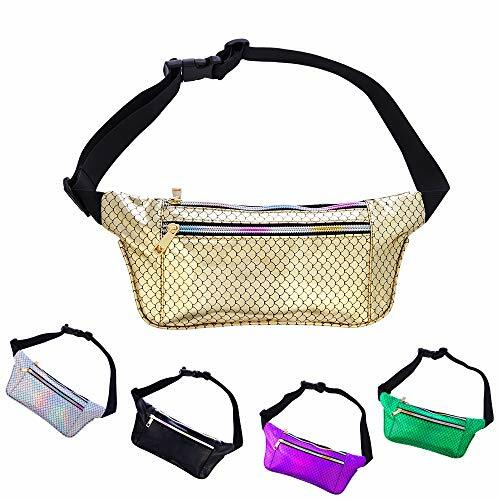 PERFECT GIFT: You could choose for 5 colors:Holographic rose gold, black, red, pink and sliver.A best gift for your friends, personal trainers, travel partners, exercise/sports partners and yourself on Merry Christmas, Halloween, Mother's Day and Father Day etc.